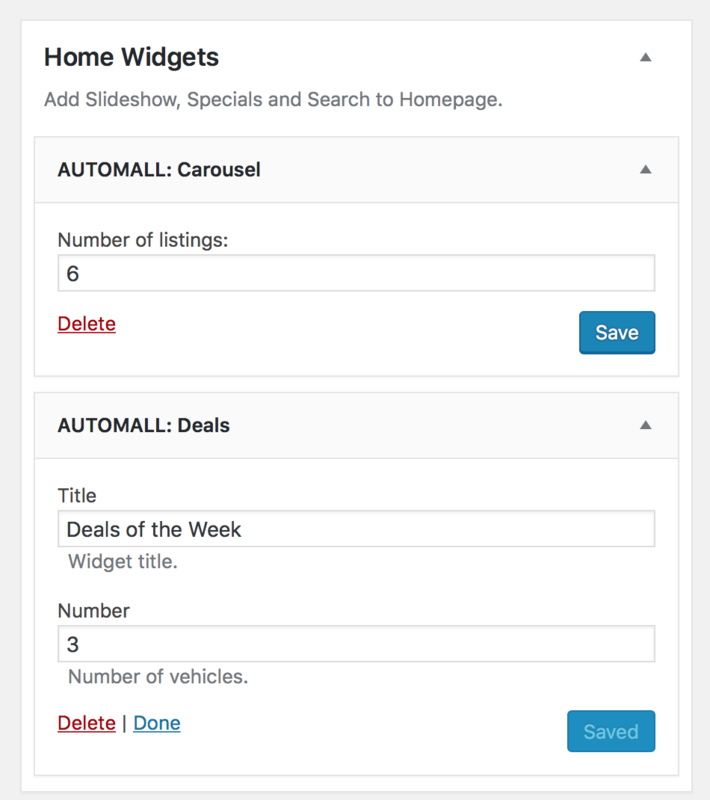 On your WordPress AutoTrade Theme Dashboard browse to Appearance => Widgets menu link to access the Widgets page to setup the search module and all AutoTrade theme widgets and sidebars. Drag the AUTOTRADE: Loan Calculator to the Sidebar module, add a widget title for the payment calculator to show in your sidebar. 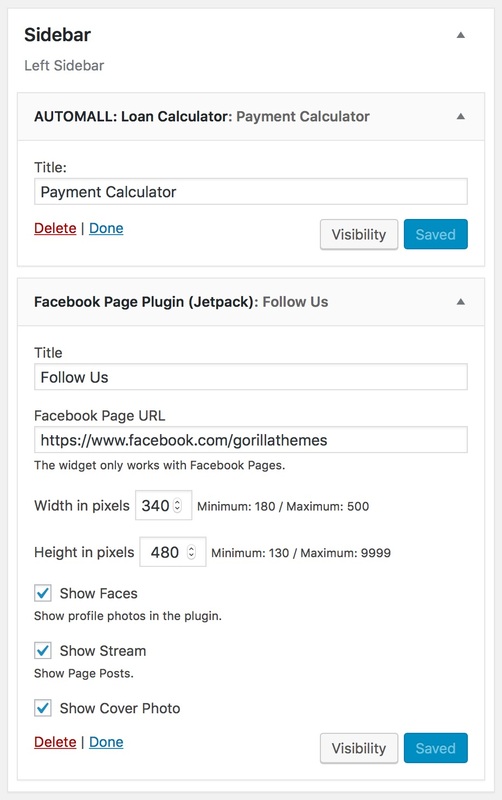 Add Facebook Jetpack plugin or add any other widget of your preference to the Sidebar module. This module is where all custom widgets and plugins should be added. 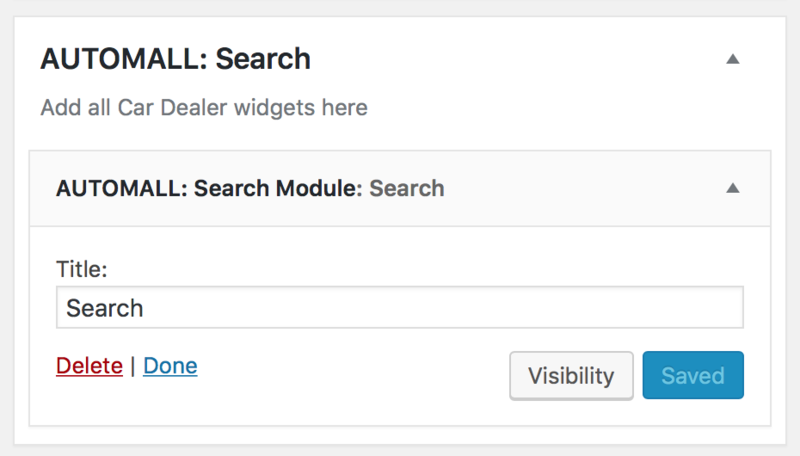 Drag the AUTOTRADE: Search Module widget to the AUTOTRADE: Search placeholder and a title to be displayed on the widget. Drag the AUTOTRADE: Vehicle Specifications widget to the Vehicle Specifications placeholder. Enter a title for your Full Vehicle Specification, (Leaving the field empty will hide the module on your page). Enter a title and text for second, third and fourth module. (Leaving the field empty will hide the module on your page). 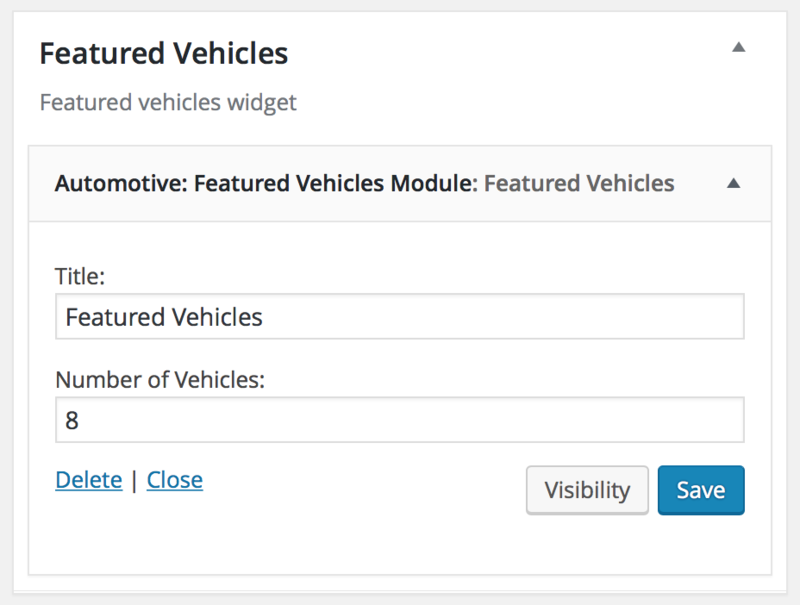 Drag the AUTOTRADE: Features Vehicles Module to the Featured Vehicles Placeholder. Add a title for your Featured Vehicles module. Add number of vehicles to show on widget (the recommend number is 8). 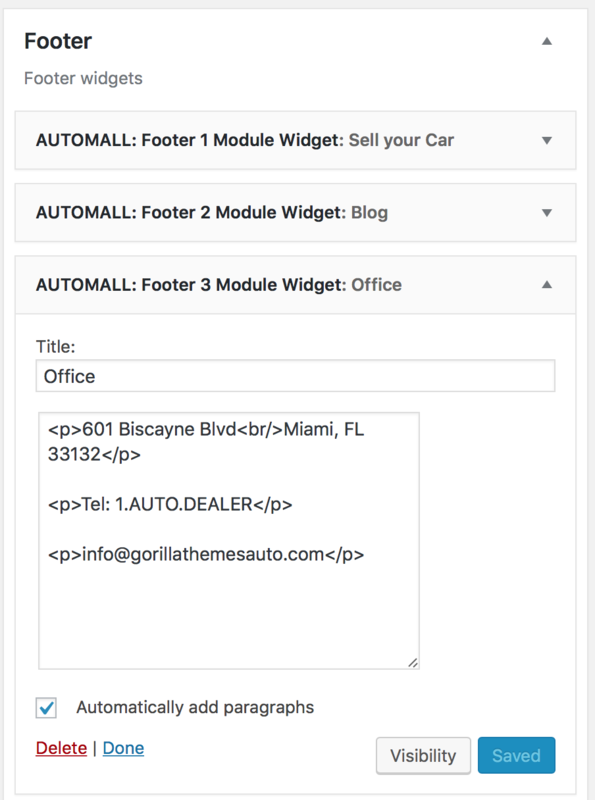 Drag the AUTOTRADE: Find by Vehicle Type Widget to its own placeholder and add a title for your widget. 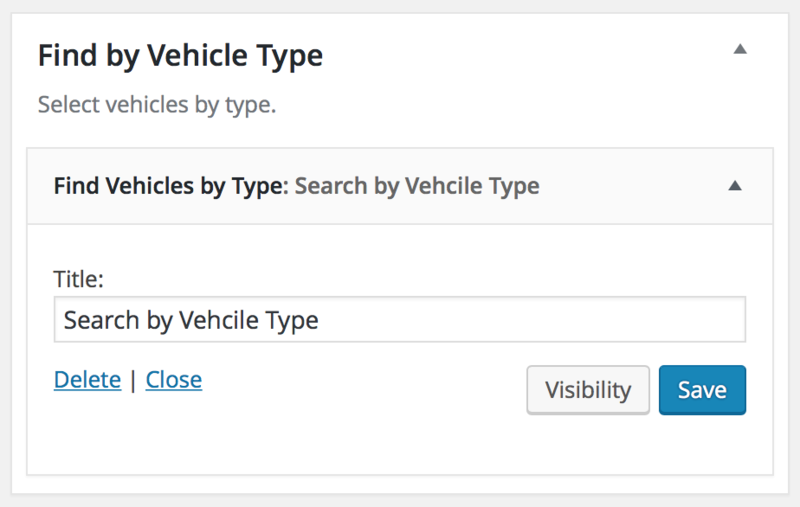 Find by Vehicle Type will show at the bottom of the website with different vehicles images to perform a listing search of individual vehicle types. 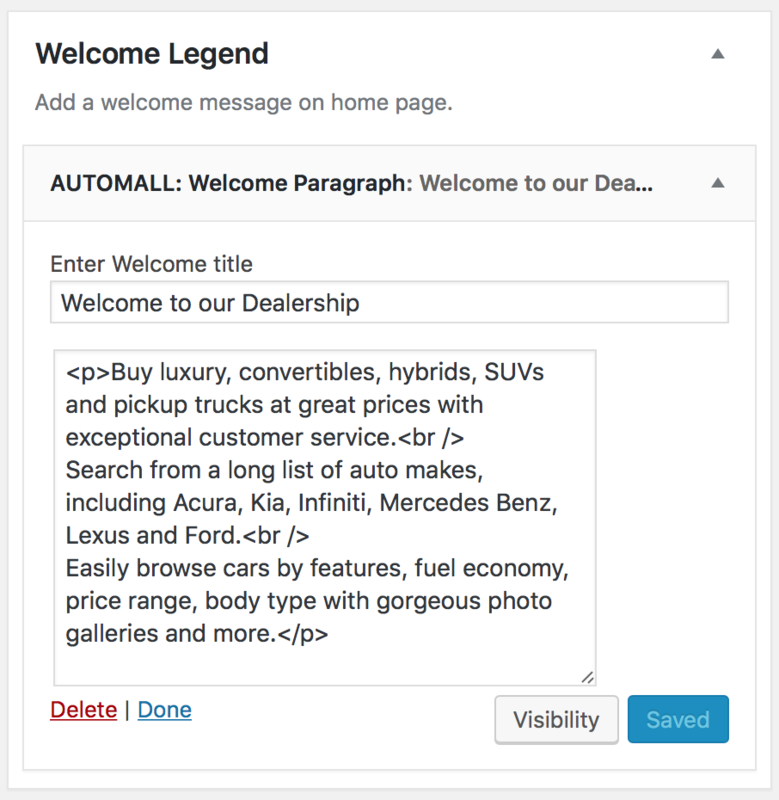 Drag the AUTOTRADE: Welcome Paragraph to its the Welcome Legend module and add a title for your widget and welcome text for your widget. 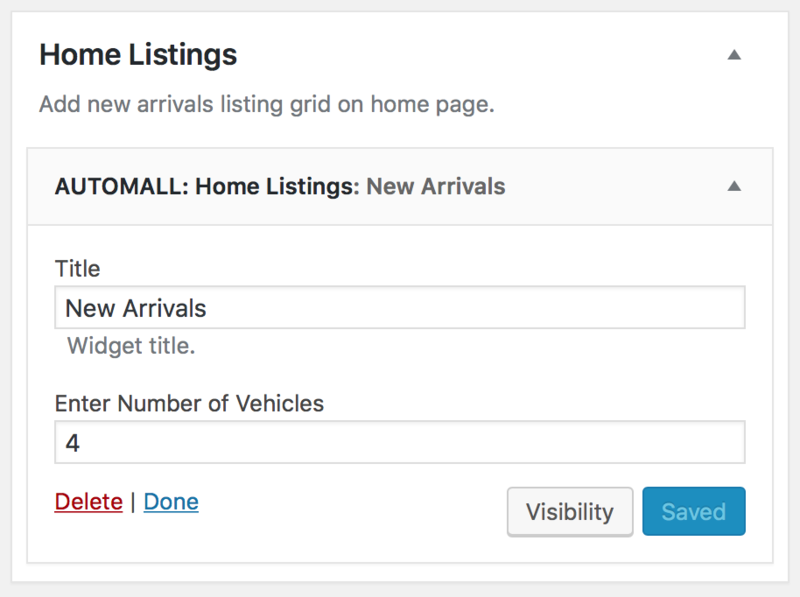 Drag the AUTOTRADE: Home Listings widget to the Home Listings placeholder, add a title and number of vehicles to show in home page. Drag the AUTOTRADE: Seller Information widget to the Seller Information placeholder to display seller name and phone number on each listing, seller information is located under Dashboard > Users > Profile(s). 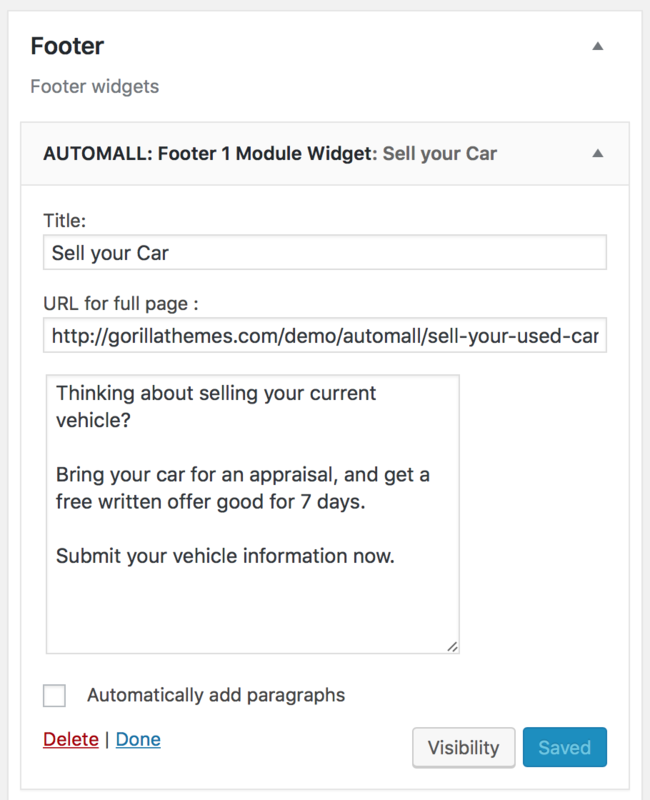 Add a link for your Sell your Used Car page template. Add content on the textarea to advertise your Sell your Used Car service. 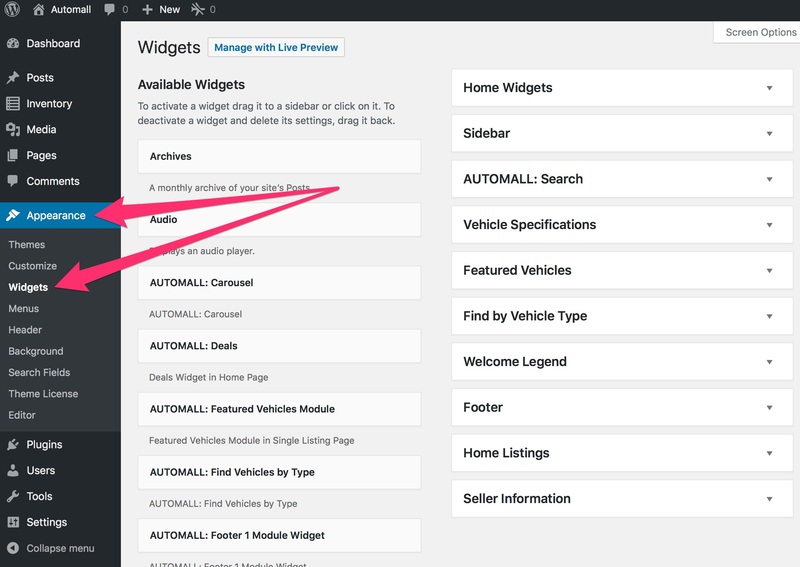 Drag the AUTOTRADE: Footer 2 Module Widget to the Footer widget placeholder. Add a title for your news/blog widget. 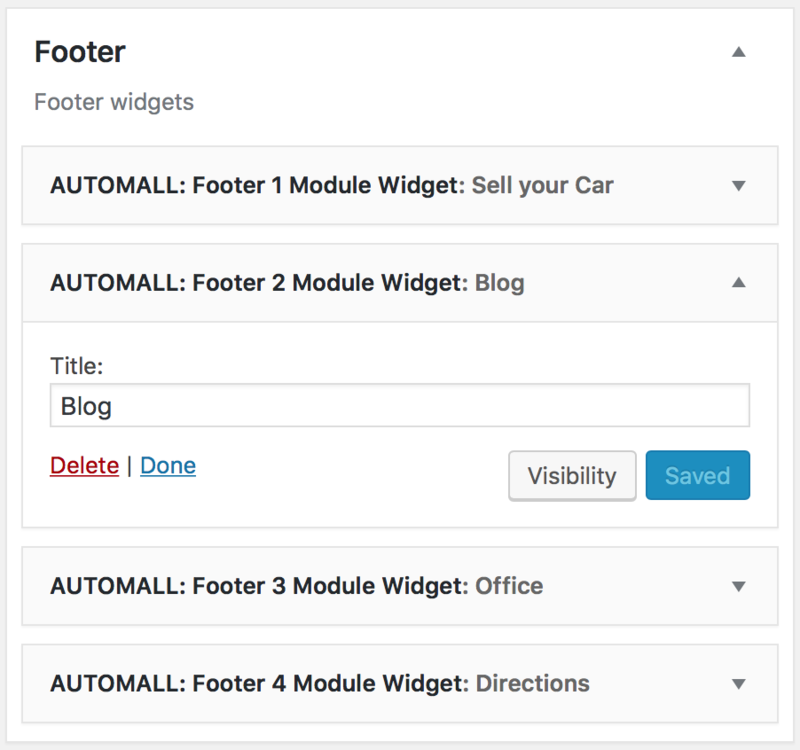 Drag the AUTOTRADE: Footer 3 Module Widget to the Footer widget placeholder. Add your business address and contact information. 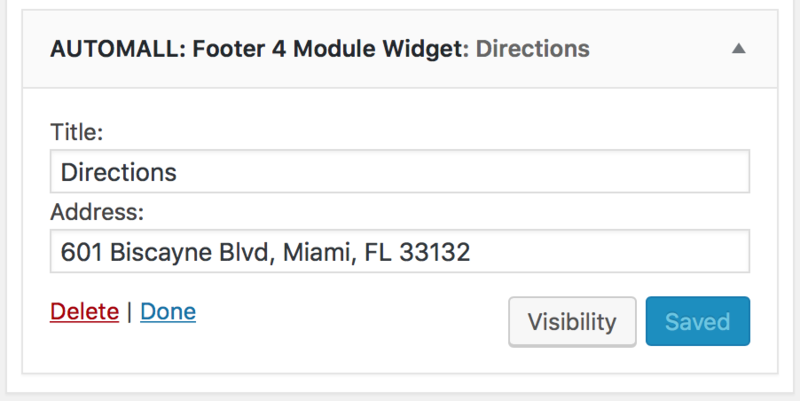 Drag the AUTOTRADE Footer 4 Module Widget to the Footer placeholder.